Antonian Nimesh Gunasinghe has been at the third position for the past couple of weeks polling 19,864 votes . 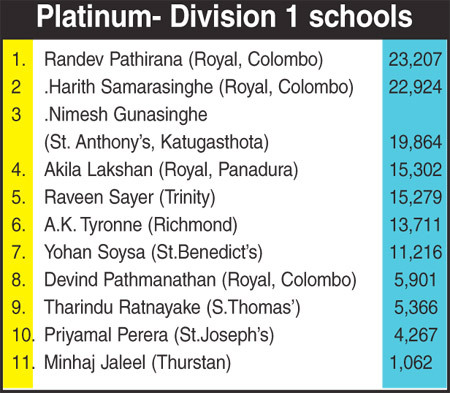 Raveen Sayer of Trinity who was placed fourth last week has been displaced by Royal Panadura’s Akila Lakshan who polled in 15,302 to Sayer’s 15,279 to occupy the fourth place. 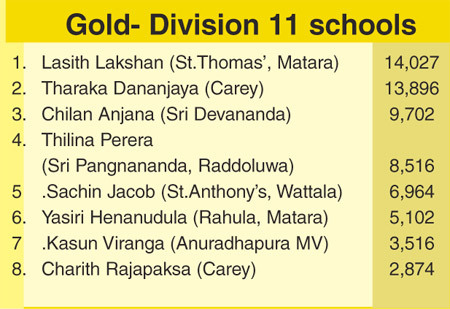 In the ‘gold’ category’ Lasith Lakshan (14027) of St.Thomas’, Matara took the first place from Carey’s Tharaka Dananjaya who had (13896) votes. 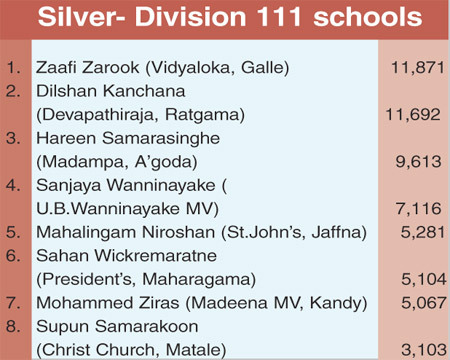 In the ‘silver’ category too, there was a change when Dilshan Kanchana (11,692) of Devapathiraja, Ratgama was pushed down to the second place by Zaafi Zarook (11,871) of Vidyaloka MV ,Galle with a majority of 179 voters.